Lion Lori thanks the club for all their help with the Murder Mystery Dinner. 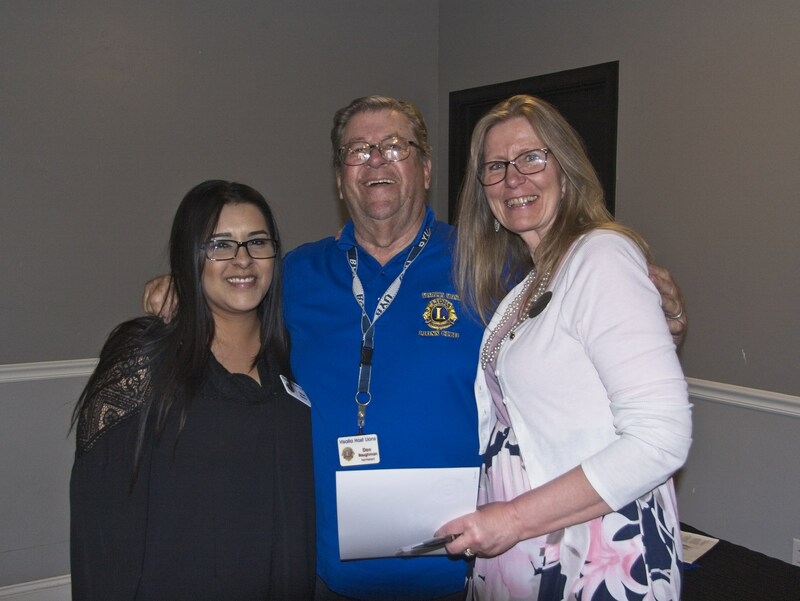 Our newest Member, Lion Kim Jenson is inducted into the club by Lion Dee, and seen here with her sponsor Lion Lori. Our president Karen lead our meeting today and called on Lion Pat to sing our song. Lion Dee lead us in prayer and Lion Jeff the flag salute. Lion Melinda announced our guests and our program today were Juleann Smith and Elizabeth Sartuche from the Miss Tulare County Pagent and our program. President Karen won the no fine badge, causing calls for an investigation on the selection process. 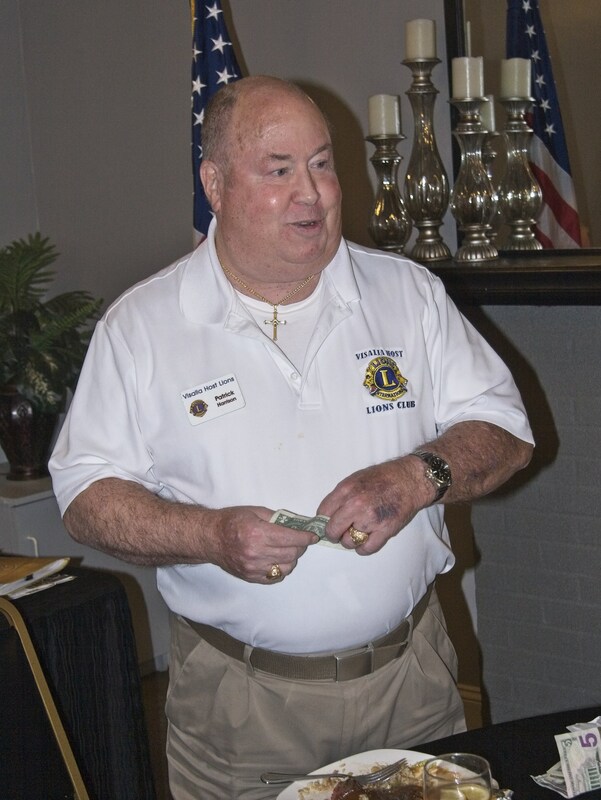 Lion Melinda announced the passing of past district governor and past international director Bob Smith. Lion Bob Smith. New Lions Kim Jenson announced that she had two tickets to Rock and Roll is Here to stay concert, put on by the Mighty Oak Cauris on April 27th. 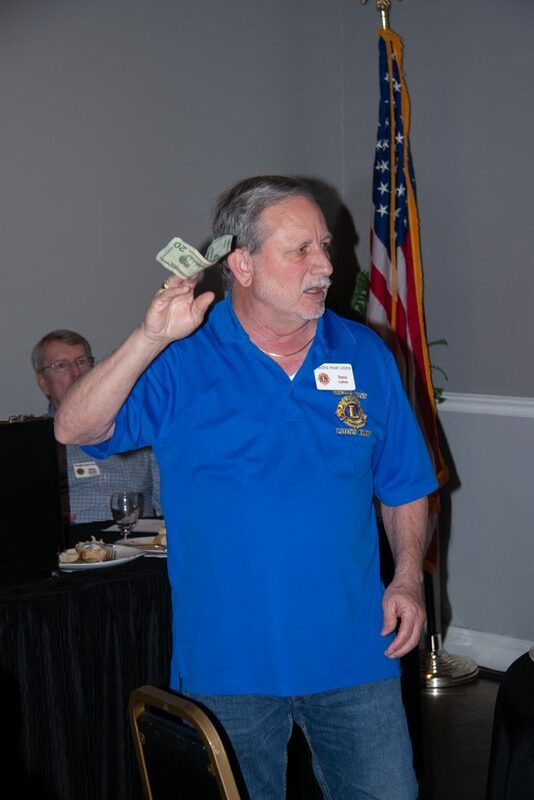 Lions Jeff had a happy dollar for the success of the MMD. Lion Carol had three happy bucks, one each for the times she won a prize at the MMD. 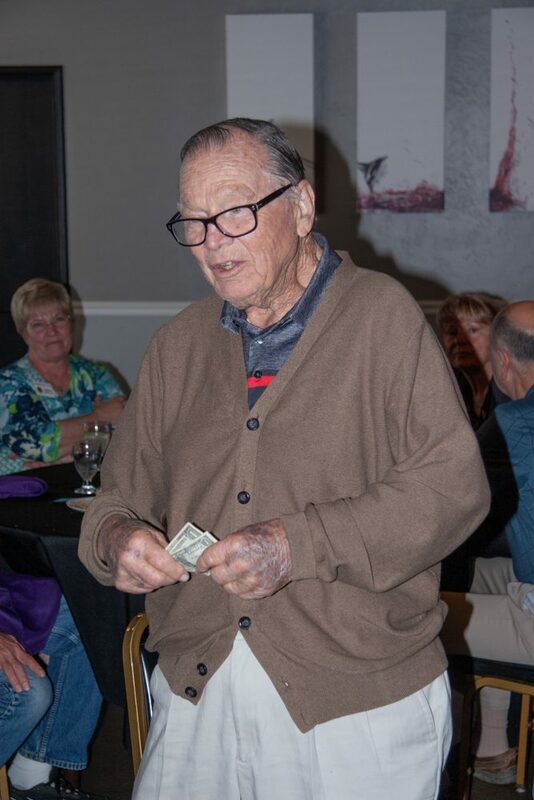 Lion Pat had happy bucks for the MMD, the food was great, the entertainment was great, and his friend won the gift basket from Roy. Lion Roy had happy bucks for the success of the MMD, for the Dodgers being in first place and for the Dodgers taking two out of three games from the Giants. Lion Ed was also happy for the success of the MMD and the Dodgers being in first place. Lion Vicki was happy for the MMD’s success, for everyone who helped out and for her husband’s continued recovery from his heart surgery. Lion George fined Ruth for taking Ton’s spot in line. Lion Roy fined Lion Tom Link because Tom’s brother, the mayor, did not know that the MMD was taking place. Lion Ed fined president Karen for not announcing the birthdays for April, bruising his fragile ego as his birthday is in April. Lion Carol fined president Karen for calling Lions Melinda Blankinship by the last name of Bettencourt. Lion Carol also was going to fine her husband, Lion Ed but then thought better of it, saying “nevermind.” Of course, that lead to rampant speculation as to the reason. Lion Bob Line was our secret great today, several people felt that was $1 well spent. 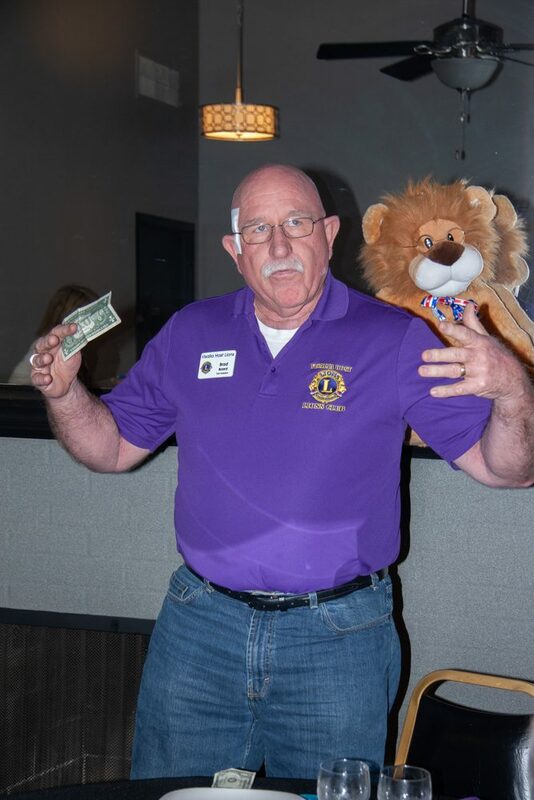 $5 raffle went to Lion Pat, who donated it to the Leo club. Loto Tickets went to Lion Roy, who will owe the club $1 as he won $10 with the scratcher. 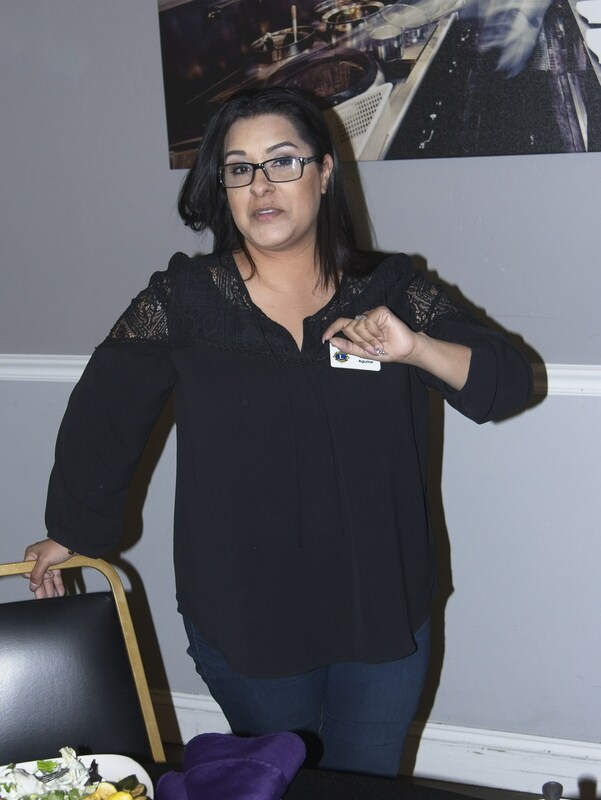 Our newest member, Kim Jenson was inducted into the club by Lion Dee, and she explained that she works at Quail park, but also makes herself a resource to people who can’t afford Quail park but need assisted living. 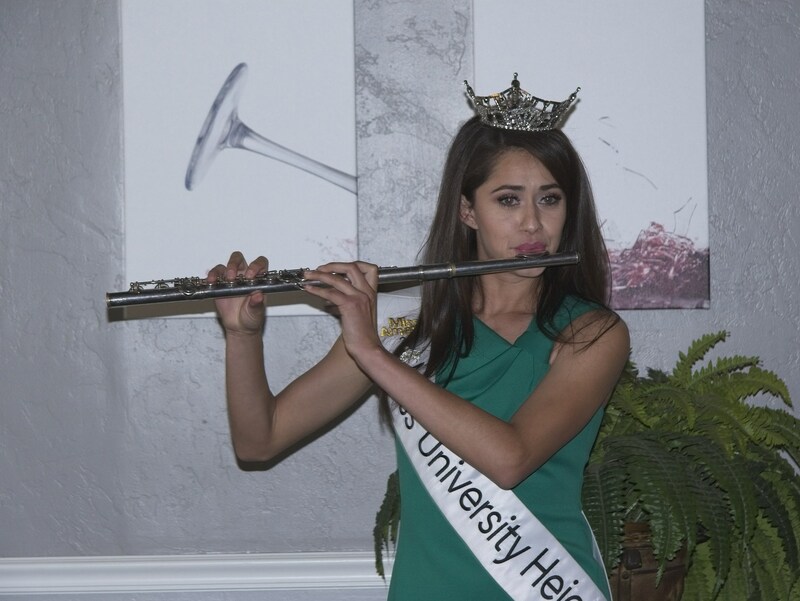 Elizabeth Sartache with the Miss Tulare County pageant plays the flute as part of our program today. President Karen won the drawing for the free add today. Juneann Smith, from Miss Tulare County pageant, Explained the changes that are going on as part of Miss America. President Karen McVaigh the meeting by asking Lion Bob Line to lead the Club in a patriotic song – Lion Bob responded with God Bless America. Lion Betty Odell led the flag salute and Lion Pete Sherwood performed the invocation. Lion Carol Jones won the “no-fine” badge for the meeting. Lion Allen Ventling thanked members for their help with a vision screening event on Sunday March 24th at the Tulare Family Health Care Network offices. Twenty-three kids were tested and four were referred for eye exams. The next event will be on April 13th in Goshen. Murder Mystery Dinner Chairperson Lauri Aguilar reported that 268 tickets have now been sold. Lion Lauri said it had been a pleasure and honor to work with the committee. Lion Don Landers donated a Lions suit jacket that will be auctioned at a District meeting. World traveler Lion Tony Loliva had a great trip to Italy and Portugal and donated twenty happy bucks. Lion Ruth McKee was, once again, happy it was Friday. Lion Don Landers will be travelling to Helendale and Vegas. Dodgers fan Ed Jones was happy to see his team in first place atop the National League Western Division. Lion Steve Gerrard donated a happy buck in honor of Lion Lion Lauri and her committee. Lion Roy Dressel was happy the Murder Mystery Dinner was almost here. Lion Craig Wheaton was happy to be back at club. 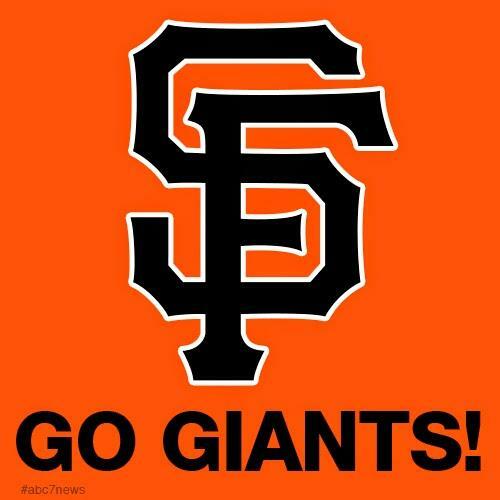 He also joked that the San Francisco giants were only one game out of first place. Lion Pete Sherwood had a chance to play golf with old friends from the Bay Area. Lion Vicki Whitehouse shared that her husband continues to do well. She also thanked Committee Chair Lauri Aguilar for her efforts. Lion Lauri Aguilar was happy the Mystery Dinner date us finally here. Lion Dee Baughman was teed off at Lions Bob Line and Tom Link for talking while he attempted to play golf. Lion Melinda Blankenship fined Lion Dee for a joke he told and Lion Tom Link for being late for the meeting. Lion Betty Odell won the five-dollar raffle and donated the proceeds to the Lions Eye Foundation. Lion Dee Baughman won the free ad. Lion Brad Board won the Lotto tickets.